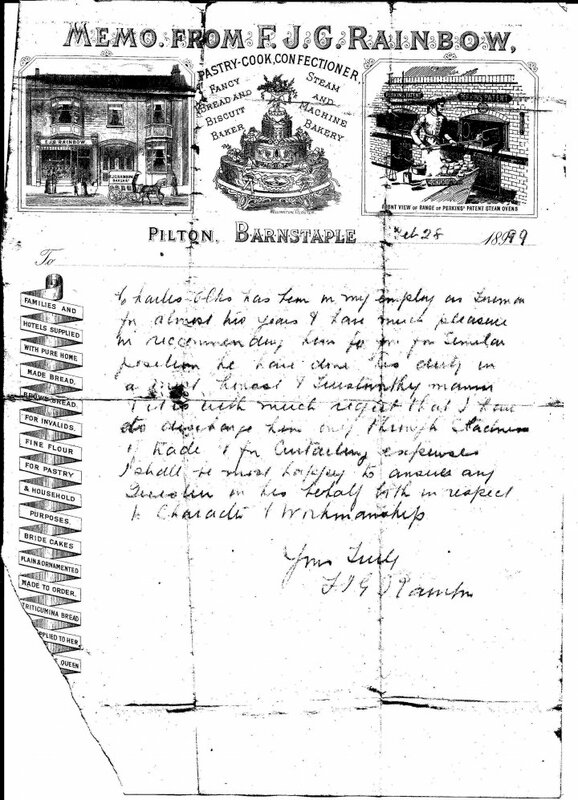 This handwritten reference from Mr Frederick Rainbow of 23 Pilton Street, Barnstaple, dated February 28, 1899, is for his foreman Charles Elks. Charles Elks has been in my employ as Foreman for almost two years. I have much pleasure in recommending him to you for similar position. He has done his duty in a most honest & trustworthy manner. It is with much regret that I had to discharge him through slackness of trade & for curtailing expenses. I shall be most happy to answer any question on his behalf both in respect of character & workmanship. After it was Frederick Rainbow’s bakery at the turn of the 20th century, by 1926 the shop was another bakery run by Arthur Robins. Further dates of business occupation are not certain until 2000 when the shop re-opened as Pilton Gallery, selling original paintings and drawings. This closed in 2002 to be re-opened as Golds Beauty Salon in 2003. Some years later Golds closed for business and moved to Barnstaple Town Centre, since when No. 23 has not operated as a business. Study of the drawing of the shop at the top of the Memo also shows the double doors to Pilton Mews and the house on the right which is No 24. Thanks are due to Linda and Les North who sent this letter to The Pilton Story and thus revealed some of the history of another property in Pilton Street.